This pie is probably one of my favorite raw pies I have made so far and everyone who tries it agrees. The avocado gives the filling a nice light green color and super creamy consistency. If you like tart desserts, you will love this pie! Start with the whipped cream, blend all ingredients on high until smooth. Pour into a flat container and place in the freezer for 2 hours until set, then transfer to the fridge until ready to use. For the crust, process the coconut, oats, salt and macadamia nuts until fine. Add the dates and process until the mixture sticks together when pressed between two fingers. Press into a lightly oiled pie plate and place in the freezer while you make the filling. Blend all filling ingredients on high until smooth. Pour filling into chilled pie crust and place in the freezer to set for 2 hours. Store pie in the fridge until ready to serve. Before serving, pipe whipped cream onto pie with an icing bag. 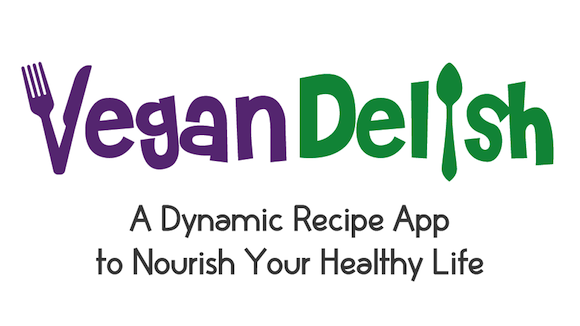 The amazing Carrie from Carrie on Vegan has made a wonderful vegan recipe app that is packed with delicious recipes from her blog and is generously offering 5 lucky winners a copy! From chocolate pudding to tempting tempeh chili, each recipe contains beautiful pictures and easy-to-follow instructions! To enter the giveaway, simply leave me a comment on this post telling me why you’d like a copy of Vegan Delish or tweet this giveaway. I will be picking 5 winners on March 28th! I normally shy away from gluten-free baking. It just seems to complicated. Most recipes have a list of 5 or more different flours that need to be used in very specific ratios. I realize that many people appreciate gluten free baked goods and so I decided to conquer my fear. I have done some gluten free quinoa cakes, but to be honest they still sort of taste like quinoa and are rather grainy. They taste great to me, but if you are trying to impress a “regular” person, I wouldn’t suggest using quinoa flour. Mix all dry ingredients in a large bowl. Mix all of the wet ingredients together including the mashed banana and one diced pear (not the nondairy milk) and pour into the dry ingredients. Mix well. Add the non-dairy milk only if the dough is very dry. The dough will be slightly more stiff and sticky than regular dough, restrain yourself from adding extra liquid. Press the dough into an oiled 9×9 or 8×8 baking dish. Lay the sliced pears on top and sprinkle and extra tablespoon of coconut sugar on top if desired. Bake at 180 C or 350 F for 50-60 minutes (I did 60), because it is a very moist cake. Remove from the oven and let cool an hour before serving. Blend all ingredients in a high speed blender on high until smooth. Add extra soaking water if necessary to blend. Place in a flat dish in the fridge to thicken for at least 4 hours. I think people love the idea of desserts that are guilt-free and healthy (I know I do). I mean really, I can have my cake and eat it too! 😉 I love trying to come up with new ways to use up an over-abundance of ingredients we might have on hand. We have quite a few bags of kale waiting to be used, so naturally, I have been trying to come up with as many different ways to use kale as I can! Kale cake? Why not? There is zucchini cake and even spinach cake! So why not kale? In a bowl, mix all of the dry ingredients together. In a food processer, process the first 6 wet ingredients until smooth. Add the soy milk mixture and process again. Pour the wet ingredients into the dry and mix thourougly. Oil a 8×8 or 9×9 baking dish with coconut oil and dust flour evenly over the oil. Press the dough into the pan and bake at 350 F or 180 C for about 35-40 minutes or until a toothpick comes out clean. Let cake cool for 10 minutes then remove cake from pan and let cool completely on a wire wrack. Cut cake in half diagonally and frost with the cashew sour cream frosting in my ebook, or leave cake whole and frost as is. Cashew cheesecakes have been quite popular in this household recently. They taste amazing and are garenteed to be a crowd-pleaser. I love coming up with new flavors. Here is my recipe for a Lemon Strawberry Cheesecake and a Strawberry Key Lime Pie Cheesecake. Orange Almond Creamsicle Swirl cake. I use to love orange creamsicle popsicles as a kid. I added almond extract to the white cream just because I love the almond flavor, but you can leave it out if you like. Start with the crust. Pour the coconut flour, salt and desiccated coconut into a food processor and process until fine. Add the remaining ingredients and process until the dough sticks together when pressed between your fingers (you may need to add another tablespoon or two of water). Press dough into a 8 or 9 inch spring-form pie pan. Place the crust in the freezer while you make the filling. Blend all ingredients for the orange filling and pour into a bowl. Blend all ingredients for the white almond filling adding just enough of the soaking liquid from the cashews to blend and pour into a separate bowl. Take the crust out of the freezer and pour 1/2 of the orange filling into pan. Swirl 1/2 of the almond filling on top and tap the pie plate to release air bubbles. Repeat the steps again and place the pie in the freezer to set for 2 hours. Remove pie and serve or store in the fridge until ready to serve. Whether you want to call it a cake or a bread, it is moist and not too sweet with a hint of banana. Sweetened with bananas and dates and made with homemade quinoa flour, this cake is wholesome enough to have for breakfast, yet decadent enough to serve to guests for dessert! Quinoa flour is quite easy to make at home, but you will need a high-speed blender such as a vitamix. Turn the oven on to 350 F (180 C). Pour the quinoa onto a baking sheet and bake for 10 minutes. Remove and blend in a blender until fine and powdery. Use immediately, or store in a airtight container in the fridge. In a bowl, mix the flour, salt, baking powder and baking soda and xanthum. In a blender, blend the 2 mashed bananas, dates, water, coconut oil, vanilla and vinegar. Pour the wet ingredients into the dry and mix well. Press the dough into a oiled 8×8 or 9×9 baking dish. Top the cake with sliced bananas and chopped nuts of your choice. Bake cake for 25 minutes at 350 F. Remove and let cool at least 15 minutes before cutting. This cake is great on its own, but I also like to serve it frosted with the cashew frosting in my ebook. I make savory dishes just about every night, but I usually find that the pictures just do not do the dish justice. Thus I resort to more of the dessert recipes to share on my blog. I taught a raw “cooking” class this weekend and this sauce was one of the recipes I demonstrated. We have been loving this sauce and have eaten it every night for about 4 days! If you don’t like cooked tomato sauces, then I would give this one a try. It is not acidic and is extremely flavorful. In this photo, I served the sauce over lightly cooked zucchini noodles, broccoli and mushrooms. I crumbled in some of my Onion, Cheese Bread which served as the “meat” for my bolognese sauce. Perfecto! This sauce is really good on just about anything. You can use it as a dip for vegetables, mix it into noodles or pour it over your salad. The optional powdered lecithin stops the tomato sauce from separating. It is not necessary, but is nice to use if you are serving this sauce to guests. If you do not have the fresh herbs on hand, you can get away with using just the dried ones listed. Blend all ingredients except olives in a blender until smooth. Add the olives and blend just until chunky. Serve. The recipe for this Raw Banoffee Pie is in my new recipe ebook Gluten Free Guiltless Vegan Desserts. I am very excited to announce my first ebook, Guiltless Vegan Desserts! This book has 12 of my favorite raw and baked dessert recipes ranging from Raw Caramel Cookie Dough Bars to Gluten Free Banana Cupcakes. All recipes are vegan, gluten free and refined flour and sugar free and focus on nutrient rich ingredients. There are full colored photos for every recipe (because isn’t that the best part ;-)). *I have had a few people comment that they would love to buy my new ebook, but they do not have a kindle. I would just like to make sure everyone knows that you do NOT need a kindle to purchase and view the ebook on Amazon. A simple free kindle download is available for both PCs and Macs and allows you to view any kindle book on your computer. Click here to download kindle for mac. It was hard for me to imagine that a raw banana bread could actually taste like… well banana bread. It is mildly sweet, moist and slightly squishy just like real bread! After I experimented with the Cheese Bread, I figured I could just substitute some of the ingredients and hope it came out well! This bread really hit the mark for us! Similar to the Cheese Bread, you do not need a dehydrator to make this. You can do it in a low oven with the door slightly open. First grind the almonds in a food processer. You do not want a fine meal or flour, but not chunks either, somewhere in between. Remove the ground almonds into a bowl and process the remaining ingredients. Pour the ground almonds back into the food processer and process until mixed. The dough should just stick together when pressed. Do not add water unless absolutely necessary. Fold the chopped walnuts and chopped medjool dates into the dough. Place dough onto a mesh dehydrator sheet or a parchment lined baking sheet (if you are using the oven). Shape into a loaf and score with a knife into slices. Place in the dehydrator at 145 F for about 1 hour or in the oven with the door ajar at 175 F (or as low as it will go) for the same amount of time. After an hour, the loaf should form a nice crust. Cut the loaf into slices and lay onto your tray. You can dehydrate/bake at the same temperature as before for about 3-4 hours or until the slices are at your desired dryness or you can turn the dehydrator down to 115F for 10 hours. If you are not using a mesh sheet, you will have to flip the slices have way through. Once cooled, store the slices in a sealed container in the fridge. Start with the crust. Pulse the rolled oats in the food processer until they are slightly broken (do not over-process). Add the almond butter, salt, xanthum gum or flax gel and process again. Next add the almond extract and slowly pour the maple syrup in while the food processer is running. Taste and adjust. The crust should just stick together when pressed between your fingers. If not, add 1 tablespoon of water. Press the crust into a 8 or 9 inch spring-form cheesecake pan (or just a regular pie plate). Make sure the crust is not too thick, it should go 1/3 of the way up the sides of the pan. Place the crust in the freezer while you make the filling. Blend the strawberries and dates until completely smooth. Pour into a squeeze bottle. If the strawberries have lots of seeds, you may need to strain the sauce for it to come out smoothly, mine was fine without straining. Blend the cashews with the warmed coconut oil, lemon juice, sweetener and vanilla. Add as much of the soaking liquid from the cashews as needed to blend completely smooth. If your lecithin is in granule form, grind it in a spice grinder before adding to the filling or use liquid lecithin. Blend the lecithin into the filling. Taste and adjust. Pour half of the filling into the pie crust. Tap the pie on the counter to release any air bubbles. Dot the surface of the filling with the strawberry sauce and swirl the filling with a chopstick or knife. This part of the filling will not be visable, so it can be your trial run. Pour the remaining filling into the pie crust and again tap the pie and dot the top with the strawberry sauce. If you are using a regular pie plate you will have extra filling. Swirl the top and place in the freezer to set for 2 hours and then keep in the fridge until ready to serve. Serve the slices with extra strawberry sauce and sliced almonds if desired.